When the condition of the flag is such that it is no longer fit for display, it should be disposed of in the same manner as the U.S. Flag, preferably by burning, and with the same dignity as is accorded the disposal of the U.S. Flag. 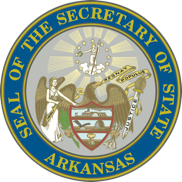 At a final ceremony the worn Arkansas Flag should be raised briskly to the top of the flagpole, followed by the pledge. Then the flag should be lowered slowly. When the flag is removed from the pole, the blue diamond field should be cut away from the red field. The red field should then be folded to one-fourth its unfolded size and-placed on a- cross bar over a fire site. The blue diamond field should then be folded in half and placed over the red field. The fire should then be lit beneath the cloth pieces. Once the flag is rendered to ashes, the ashes should be collected and buried.